The wheel of time turns and chipsets come to pass, and a year after the Z77 chipset’s launch, you can pick up top-spec boards for a fraction of the price you could just a few months back. MSI’s Z77 MPower is one such mobo, packing in a rather impressive specs list for £135. Bargain, but by no means budget. The Z77 chipset may be getting a little long in the tooth now that we’ve got the twin joys of the new Z87 and fourth-generation Core CPUs (Haswell) on the horizon, but if you’re talking about a gaming machine relying on discrete graphics, the Ivy Bridge chips and the related top chipset are still going to be practically as capable. The imminent Haswell CPUs aren’t going to deliver any exceptional boost in the CPU performance stakes, being more focused on energy efficiency and improved integrated graphics. Yup, they’re going to be mobile parts re-engineered for the desktop. Same as it ever was. But that means if you’re looking for a mobo upgrade, you needn’t concern yourself too much with hanging around for the next generation. Us PC gamers aren’t going to see much improvement once you’ve dropped a discrete GPU into the mix. 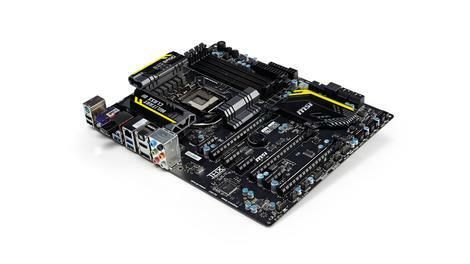 The Z77 is one of MSI’s latest boards with Windows 8 certification, and it packs quite a punch. Despite the sub-£150 price point, it doesn’t feel like MSI has had to make any real compromises with this setup. There’s a wealth of USB 3.0 ports on the rear panel, wireless networking built in, and both DisplayPort and HDMI connections sprouting out the back. In fact, the only thing you’re missing is a Thunderbolt connection, but with such limited support in peripheral form right now, that’s hardly a real problem for most of us. You’ve also got Nvidia SLI certification for those green-tinged multi-GPU shenanigans, which is a rarity in such a well-priced board. Of course, with multiple PCIe 3.0 slots, that means you’ve got full support for AMD’s CrossFireX setups too. You know, for completeness. The MPower has also got a lot of support for overclockers. There are the serious tweaker’s voltage check points if you want to get the multimeter out, and onboard controls if you’re playing with the board on a test bench. Those may not be a lot of use for most, but the dual-BIOS setup could well be. It means you can easily recover if you end up borking one with an over-enthusiastic OC or firmware update. Performance is impressive too, with MSI now enabling its boards to run Intel’s Turbo Boost on all cores, not just one. That means our 3770K was running at 3.9GHz all the way, and we easily hit 4.8GHz on the overclock too. Unfortunately though, it’s still lagging a little behind the Asus-shaped P8Z77-V Pro, an equivalently-specced and priced board. The Asus just about has the edge in both raw CPU performance and memory terms too. Still, MSI has produced an impressively-specced board at a great price.